Two Coloradans and a resident of New Mexico were arrested in Tennessee. 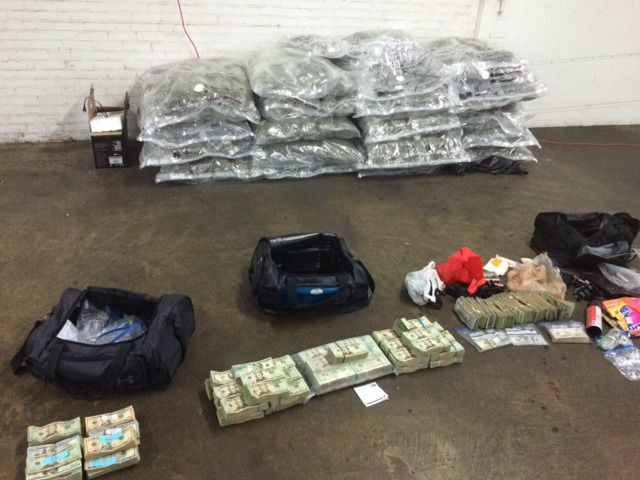 Officials said they had pounds of marijuana and hash bound for distribution in North Carolina. Officials in Oklahoma and Nebraska have sued Colorado over costs related to local legalization. • In November, three people — two from Summit County and a third from New Mexico — were arrested in Tennessee after investigators found them with 425 pounds of what the Metropolitan Nashville Police Department called “high-grade marijuana from Colorado” valued at $1.7 million, along with nearly $355,000 and 17 cellphones. • In January, two men from the metro Denver area were arrested after a routine traffic stop in South Carolina and found with 168 pounds of marijuana with a street value of around $900,000. The marijuana was believed destined for Charlotte, N.C., according to news reports. • In January, Pueblo police responded to a UPS facility after being alerted to a suspicious package. Inside: $58,000 of high-grade pot and $5,000 worth of marijuana edibles bound for San Angelo, Texas. Police say 23-year-old Johnny Wolfe was trying to ship the package to his home in San Angelo; he was later arrested by authorities in his home city and extradited to Pueblo to face charges. • Earlier this month, brothers Gideon Barker, 19, and Seth Rhoades, 21, of Wisconsin were charged with drug conspiracy after police investigated a 45-pound marijuana bust. Police say Barker paid drivers to travel to Colorado to pick up large quantities of marijuana and take it to Wisconsin. Authorities found more marijuana, cash, drug paraphernalia, marijuana edibles and a document titled “Dos and Don’ts When Making a Run to Colorado” at Barker and Rhoades’ home. Americans’ consumption of all three drugs — marijuana, meth and heroin — is on the rise, and Colorado’s use rates are higher than the national average, according to the National Survey on Drug Use and Health, which is funded by a U.S. Department of Health and Human Services agency. Colorado’s black-market marijuana trade is hardly limited to cartels — and state officials can’t say how much marijuana flows through it. However, they estimate that only 60 percent of the marijuana consumed in Colorado is purchased through legal channels. The rest is sold through illicit operations that include back-door sales out of warehouses and other licensed facilities and home-grow operations far exceeding the six-plant limit Colorado law allows those 21 and older to cultivate. Colorado’s home-grow market is “minimally regulated” and a chief area of concern, said Lewis Koski, director of the state’s Marijuana Enforcement Division. Yet home-grows take a back seat to the division’s mandate to ensure that Colorado’s 2,250 licensed marijuana facilities — businesses including edibles manufacturers and retail marijuana stores — follow the rules. Of the division’s 55 employees, 38 conduct criminal and compliance investigations, spending most of their time at licensed establishments. The office is requesting 13 additional, full-time employees. “One of our main enforcement priorities is specifically focusing in preventing or limiting the diversion of regulated marijuana outside the state of Colorado,” Koski said. Promises of increased enforcement ring hollow with law enforcement agencies in several other states. Sheriffs in neighboring Kansas and Nebraska have joined sheriffs from Colorado in filing a lawsuit against the state, alleging in part that Colorado’s inability to keep black-market marijuana from flowing over its borders has put an economic burden on other states. Traffickers are also flying the drug across state borders, former Colorado Attorney General John Suthers told The Gazette. “I can’t talk details, but there’s some cases in the pipeline that I think will come to fruition in the next month or so that will indicate just how much marijuana is going straight out of grow operations in Colorado to regional airports and being flown to other states,” he said. Then there’s the black-market marijuana that stays in Colorado — much of it falling into the hands of the very people legalization proponents said regulation would protect: youths. Marijuana use among Colorado adolescents is among the highest in the country, the state’s public schools are reporting record numbers of marijuana-related problems, and healthcare providers say diversion of the drug from legal recreational and medical buyers to underage users is common. One study conducted by researchers at the University of Colorado found that about 74 percent of teens reported using marijuana they had obtained from a medical-marijuana license holder.